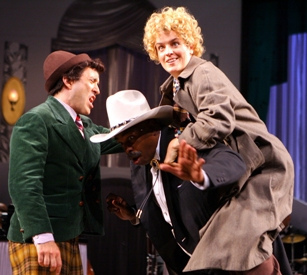 A scene from 'Animal Crackers' directed by Wishcamper at the Goodman in 2009. - Celebrate your 25th anniversary; give back to the community; raise money -- it&apos;s all in the plan for ComedySportz this year. "Over our 25 years, we&apos;ve seen how the joy, imagination, and laughter that come from improv comedy make people&apos;s lives better. We&apos;re so grateful for the support we&apos;ve received in this community, that we wanted to help other organizations that make Lakeview and the world better places to live," said ComedySportz President and CEO Matt Elwell in a statement. This means they&apos;re working with groups like The Night Ministry, Funny Bones Improv, the Lymphoma Research Foundation and the Sam Thompson Foundation. To learn more, head to their website. - Henry Wishcamper is now a new resident artistic associate of the Goodman Theatre, reports Hedy Weiss of the Sun-Times. As previously announced, Wishcamper will be directing Other Desert Cities in January at the Goodman. Additionally, Seth Bockley will be an artist-in-residence for two years at the theater. - Some thoughts on the lack of love for Nathan Lane in this years Equity Jeff Award nominations, as well as who should win, from Bob Bullen.